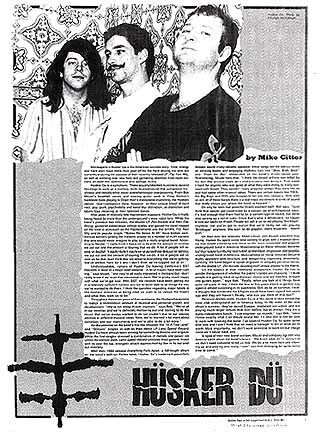 Hüsker Dü is a symphony. Three equally talented musicians ascend the stage to work up a swirling, multi-layered sound that juxtaposes harshness and melody while never overwhelming or overpowering. From Bob Mould's heartfelt vocals and soaring guitar work to Greg Norton's backbone bass playing to Grant Hart's metronome drumming, the Hüskers deliver. Don't categorize them, however, as their unique blend of hard rock, pop, punk, psychedelia and metal blur distinction, as distinction and labels lose meaning at their talented hands. After years of relatively little mainstream exposure, Hüsker Dü is finally being heard by more than the underground's most rabid fans. While the band's previous two releases, the double LP Zen Arcade and New Day Rising, garnered tremendous college airplay and gained the band respect on the level of acts such as the Replacements and the Smiths, Flip Your Wig and its popular single "Makes No Sense At All" have broken commercial barriers, getting the Hüskers airplay on a number of AOR stations that one would never imagine to play such a vitally original band. According to Mould, "I really think it has a lot to do with the amount of records we put out and the amount of touring that we do. A lot of people will resent us for that, but I think that we deserve everything that we're getting. We've worked hard for it and I don't think we've copped out at all." 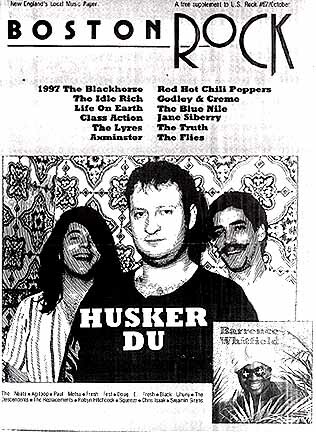 Understandably, rumors of Hüsker Dü leaving California's SST Records in favor of a major label abound. "A lot of majors have been calling," says Mould, "and they're all really interested in the band, but I don't really know if we're all that interested in them. We're pretty much happy with what we've got now. With SST, the records have been getting out in a relatively sufficient number and we've been able to do things the way we've wanted to do them. I think the question regarding major labels at the moment concerns us being what we want to be versus the majors and what they want us to be." Throughout the seven years of their existence, the Hüskers have come to realize a tremendous amount of musical and personal growth and development. "We're not doing thrash any more," says Bob. "We're all in our twenties and we're definitely mellowing out and starting to do the music that we've always wanted to do but couldn't due to our playing abilities or different musical ideas. Now, we've learned a lot more about ourselves and our instruments and we're able to do a lot more." As documented on the band's first few releases, the "In A Free Land" and "Statues" singles as well as their debut LP Land Speed Record, Hüsker Dü have always been striving for something diverse and original. While the first singles stressed a combination of melody and power not unlike the earliest punk, Land Speed Record predates most generic thrash with its over the top, energetic attack approached by few in its out-and-out intensity. With their 1983 release Everything Falls Apart, a full-length album on the band's self-run Reflex label, Hüsker Dü's trademark powerfully melodic sound finally became apparent. While some songs, like the title cut, relied on enticing hooks and engaging rhythms, cuts like "Blah, Blah, Blah" and "From The Gut" elaborated on the band's thrash-rooted past. Reminiscing, Mould feels that, "I think that the thrash artform was killed by the fact that anyone could do it and everyone was doing it. That made it hard for anyone who was good at what they were doing to really succeed with thrash. They couldn't really progress unless they were like us and had other musical ideas. There are certain bands like TSOL, the Big Boys and DYS who happen to fall into this category. With both us and all of these bands there is a real linear movement in terms of sound that really shows you where the band is headed." On why he feels that powerful thrash doomed itself, Bob says, "I just think that people got constricted by a certain set of self-imposed rules. It's bad enough that there had to be a certain type of sound, but there also sprang up a certain set of rules. Once that's what it became, we began to turn our backs on thrash. People will yell at us for not playing 'Bricklayer' any more, but you've got to realize that we're really not into playing 'Bricklayer' any more. We want to do poppier, more subtle stuff." On their next few releases, Metal Circus, Zen Arcade and New Day Rising, Hüsker Dü spent some time coming to grips with a musical identity that would ultimately dub them as the most respected and popular underground band in America. Musicianship on these releases became highly apparent with structure and songwriting improving immensely. Lyrically, the band began to speak of growth in uniquely personal terms, with the double LP Zen Arcade devoting itself almost entirely to the theme. On the subject of their newfound acceptance, Hüsker Dü has to ponder the question of whether the public's tastes are changing. "I think people are getting tired of synthesizer music and are heading straight into guitars again, " says Bob. "Really, when you look at it, things have gone full cycle. In fact, I think the four or five years it took to go that way again is almost surprising in its quickness. Still, as far as signings, I really thought that bands like the Effigies would have been signed two years ago, and they still haven't. Really, who can you think of that has?" Personal doubts aside, Hüsker Dü is at this point in their career the most vital underground act in America today. In the wake of their new album's success, they've toured Europe, produced two videos, and are playing much larger venues than ever before; but as always, they are a highly independent bunch. "I can engineer our records," says Bob, "since I know exactly what it should sound like. I'd also like to still be able to work with booking the band. I've booked Hüsker Dü for quite some time now and I don't think we need a manager to tell us what we're worth. Most importantly, we don't want someone to work on our image, since we'll never have one." In spite of their newfound acclaim, Mould and company are still very down-to-earth about the band's future. "We know what we're doing and we don't need someone to tell us that. We do a lot more than just showing up and playing, and really, I can't see that changing for quite some time to come."